This nightstand is beautiful! Since it is pretty big it looks more balanced next to a king sized bed. It came on time and with no damage and was easy to assemble. I think all my husband had to do was screw on the feet. In your choice of gently distressed finishes, this nightstand is a lovely addition to any space. The lower shelf allows you to store and display taller items, and the drawer helps you keep necessities close at hand. I bought two of the antique white night stand for our master bedroom and they are beautiful! Great color, larger than your average night stand (which we wanted). They are also very easy to assemble and feel sturdy. I also had a great experience with their customer service. 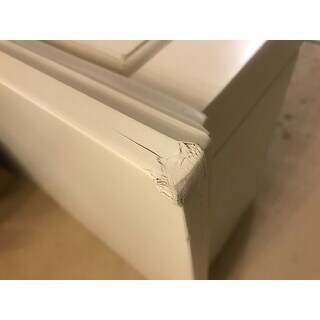 One of the nightstands had a dent on the table top, likely just from shipping. I emailed customer service and they shipped my replacement parts the next day. 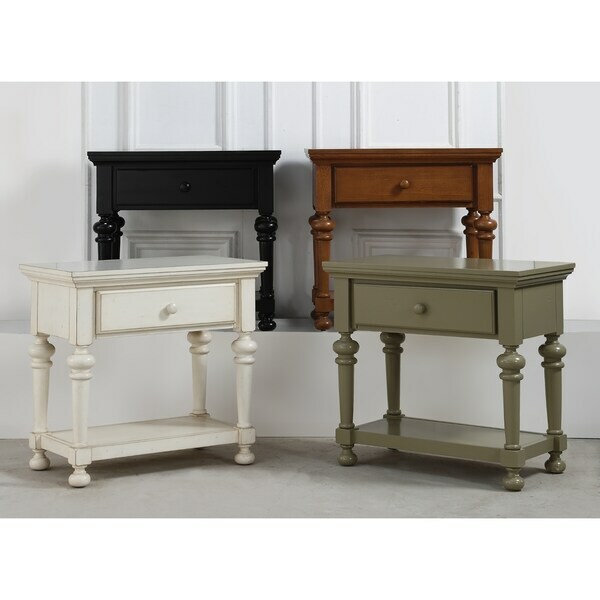 I purchased two of these nightstands for my master bedroom. They are really nice. I wanted something big enough to look right with our King size bed and vaulted ceiling. This is it. They were very easy to assemble. Im very pleased with this purchase. Product as described, good quality, I would recommend them. Amazing sturdy construction for the price. I would but it again in a heartbeat. It had two little scratches that I wish weren’t there to make it look weathered, but I can live with it. It’s a great piece. When I purchased my bedroom set several years ago they only had one night stand. These matched my set perfectly and I couldn't be happier. The price was good and the quality is also. It took no time at all to complete putting them together. I purchased two of these in black for a spa retreat to hold massage equipment. They are well made and serve the purpose perfectly! Recommend! Absolutely love these nightstands! I was looking for something not too bulky like a table but still had some storage. Assembly couldn’t be easier. I’m 8 months pregnant and did it myself. Legs screwed right on. No tools needed. My table was damaged on the corner, contacted Overstock.com and they sent another table that was perfect. Now need to have them pick up the damaged table? Cute table, will certainly get the job done... however not the most stable/best quality. Ours has one leg that’s ‘off’ a little so it rocks and isn’t firm standing. Maybe felt pad will help level. Nice nightstands. Very pretty color. I purchased the green. One of them did have a knick in the front and only a little noticeable. Overall, the delivery was fine. Would definitely purchase these tables again. Price. Good Reviews. Good Size next to king sized bed. Color. "Hello! I need to know the measurement of the bottom shelf! Thanks!" "How much assembly is there? Please describe. Thanks!" The nightstand requires minor assembly including attaching the legs and bottom shelf.